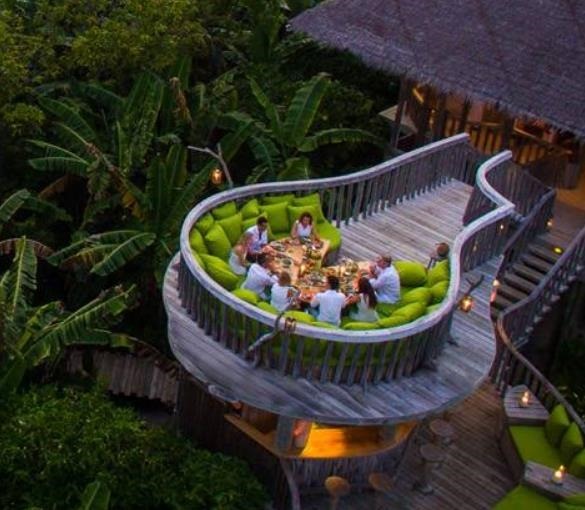 Even its distinctive floating furniture add to the dangling design vibe of the resort. 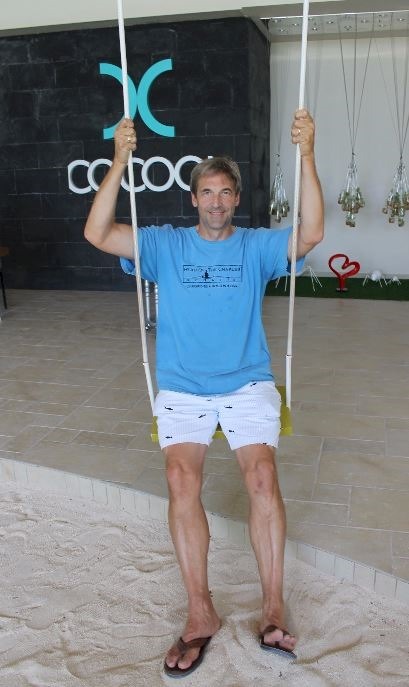 Lots of resorts have swings, but Cocoon has them in places I’ve never seen before like the reception (see above, great for soothing the sadness of saying goodbye when waiting for your return transfer), and the bathroom (see below, not sure what this is great for…maybe to help get things moving??). Sunniest time of the year. Well, the longest amount of sunshine in the day (depending on your time zone). Not that it matters that much at the Equator where daytime doesn’t vary all that much. Still an occasion to call out another quirky resort distinction. After visiting nearly 100 resorts, Dhigufaru did strike me as the “sunniest”. Essentially, the property was developed from an existing sand bank. As a result, the foliage is less dense, less tall and less mature. Walking around you feel the sky and sunshine everywhere. 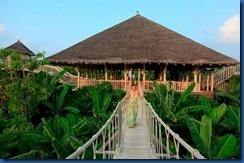 Conversely, many parts of many resort islands have dense canopies that can almost feel like tunnels of greenery. 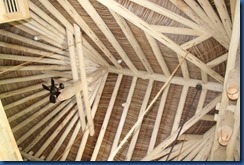 Treehouse – Let’s start with the fundamentals of elevated living – the Treehouse. 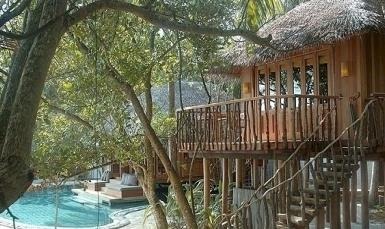 As in “Villa Suite with Treehouse”. Especially suited as an annex for children. 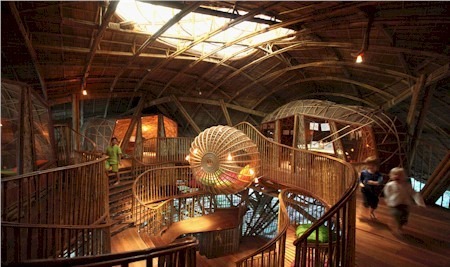 Kids Club – If your childhood Disney fantasies overcome you and you decide to take the treehouse for yourself, at least the kids get the multi-story labyrinth of whimsy that is the “Den” kids club with plenty of climbing places including their own outdoor play treehouse. Dining – But the whole family can enjoy a soaring supper at the “Fresh in the Garden” (or over the garden) restaurant deck. Walkway – Of course, to get there you need the obligatory Indian Jones rope bridge. One the first, longest and highest. 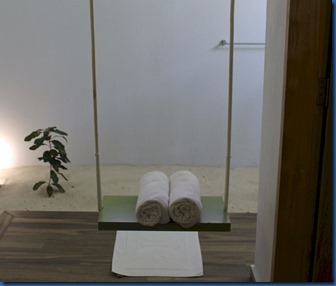 Spa – The second story treatment rooms and chill out area adds a vista to your vinyasa. 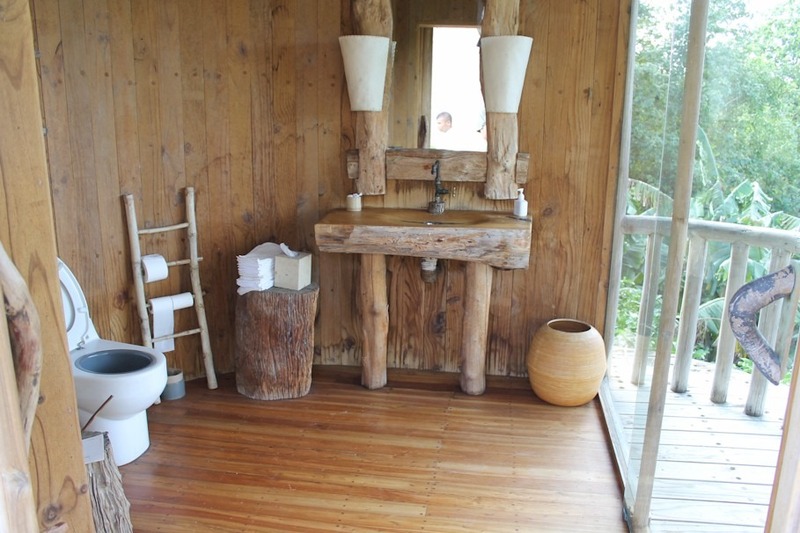 Toilet – Loo with a view. ‘Nuff said. 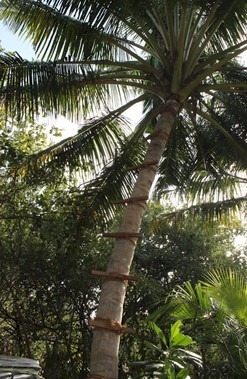 Palm Tree Climbing – If you don’t have the climbing dexterity of some of the Maldivians. 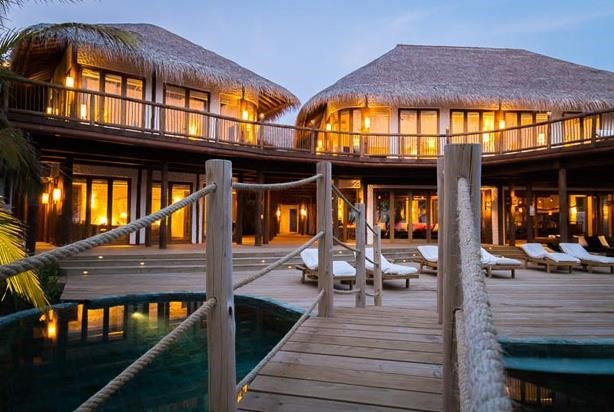 Villas – Taller villas than anywhere in the Maldives with sweeping wrap-around decks for 360 degree views. 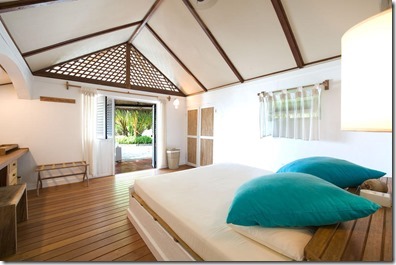 Mattresses – The thickest mattresses in the Maldives so even when you lie down, you get lifted up. Ceilings – And when you do lie down, your gaze extends quite high to some soaring ceilings that exemplify the SFR chic aesthetic. 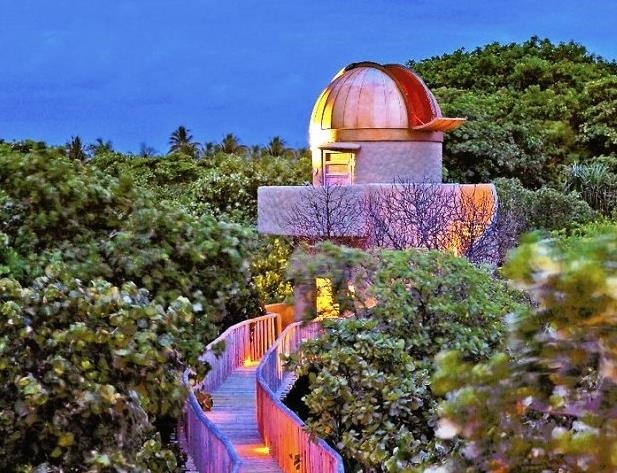 Observatory – If none of that is high enough for you, Soneva was the pioneer of lifting their guest up to the star above with the first astronomical observatory in the Maldives. 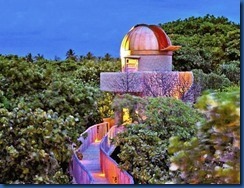 Naturally, the telescope itself is nestled in the treetops accessed by a canopy crossing walkway. There is one exception which is Soneva’s sunken pool seating which is the lowest seating in the Maldives being literally below ground level (without being underground). People come to the Maldives to get away from it all. And at Rihiveli Beach, that does mean *all*. I characterise the Maldives by saying “You know those tropical island cartoons with a plot of sand and a palm tree…that’s the Maldives, a thousand of those.” Admittedly a bit of an exaggeration but an effective caricature. 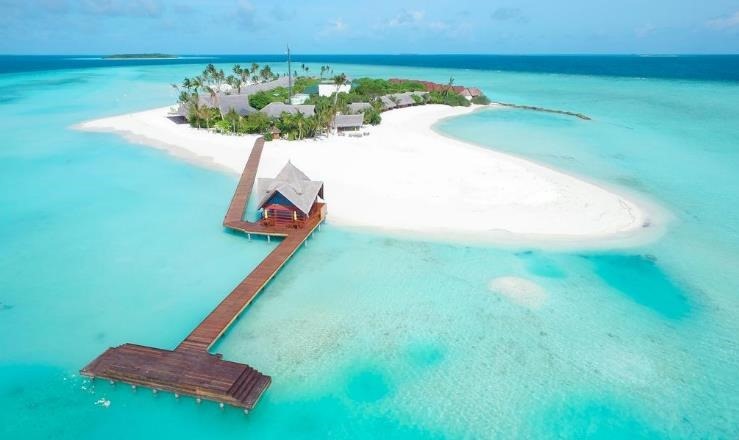 As the Maldives tourism industry has developed now you can go to islands with towers, golf courses, gourmet restaurants, water parks, 9-bedroom villas, etc. In the wake of this expansion and development, a hardened cadre of Maldives purists yearn for the simpler days much more approximating Gilligan’s Island than Thurston Howell III’s estate. And I haven’t even mentioned the biggest one – no Air Conditioning. As I mentioned in my tour review, this was the biggest challenge for us especially as the weather was particularly toasty and the breeze unseasonably calm. Our pragmatic solution turned out to be downright romantic (in a clean and decent way) as we slept on our loungers under the stars for one of the most memorable nights of the trip if not all our visits to the Maldives. But if such al fresco snoozing is a bit too exposed for you, then there is actually salvation at hand on the island. 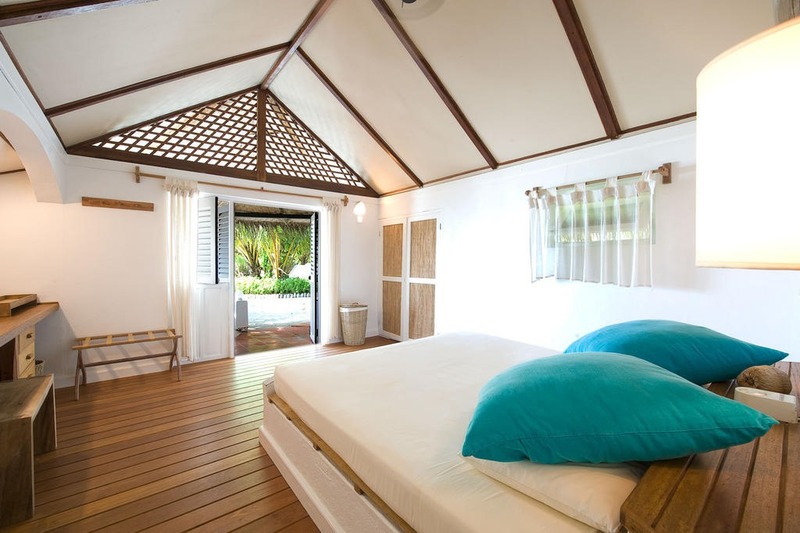 13 of their Standard Bungalows (namely – Boova, Bouraki, Carangue, Cardinalia, Cassis Nana, Dauphin, Demoiselle, Dentice, Digumas, Diodon, Diodora, Donax, Donhica) and their single Deluxe Villa (Escondida) do have AC. The Standard rooms with AC do have a $35 supplement. So why would anyone put up with such limitations? 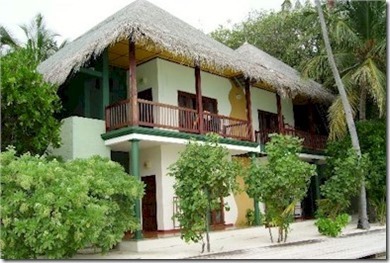 Value – The property is one of the most affordable of the resort islands. Get Away From It ALL – Especially technology. If I had kids addicted to technology, I would bring them here. They wouldn’t be able to check their phones most of the time. 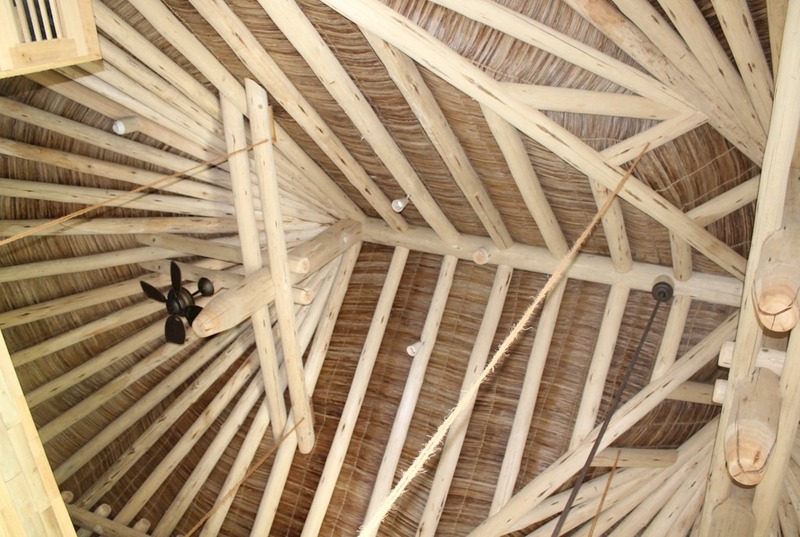 Authenticity – The closest to living the traditional Maldivian lifestyle. 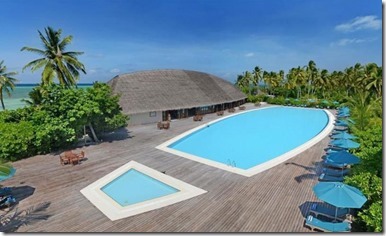 Island – Rihiveli is simply on of the best neighbouring-island/lagoon combinations in the Maldives. 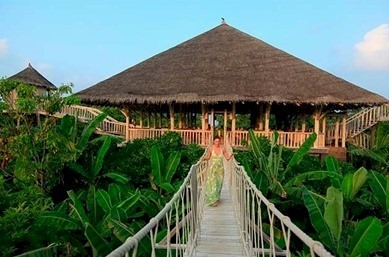 With the ample bar, delicious food, water sport centre, Balinese spa, etc., it’s not exactly Bear Grylls material, and it might be just the type of escape to paradise you are looking for. Many of these activities have been replicated and even prevalent across the holiday destination, but as the posts describe, in most cases they were the pioneers to introduce these far flung experiences. LUX is always pushing the boundaries of luxury and perspective. 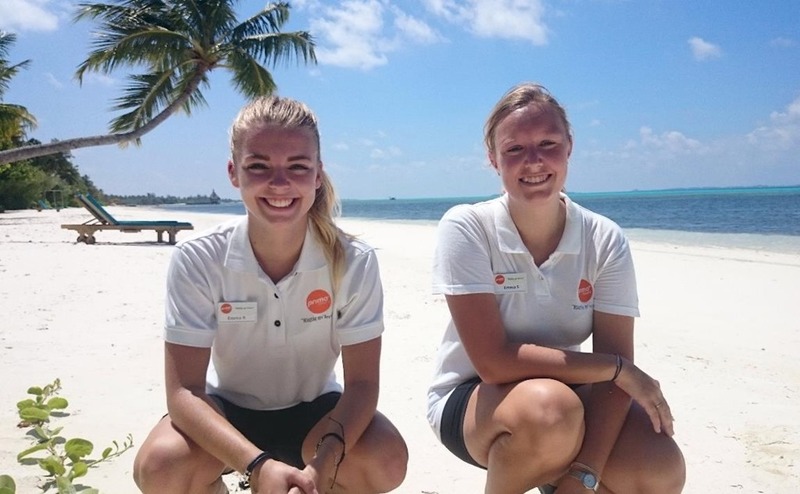 Note: If you are interested in more details, see their website, but they only have Danish guests travelling to Maldives so their webpage is in Danish. Den solrige side af livet! If you can’t build out, then build up. Given the limitations of real estate in the Maldives, I always wondered why there weren’t more multi-story buildings there. The higher levels also have the added benefits of providing a vantage point over the mottled maritime mosaic that surrounds every island. But an increasing number of Presidential villas and palatial super-premiums do come in multi-story in recent years. In fact, I would hazard that a second floor is almost becoming standard fare in the super luxe category. Still, you don’t need an elevated budget to get an elevated view. 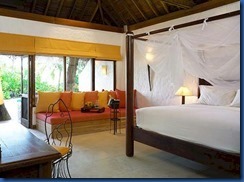 A number of value-priced resorts also offer upper level rooms in the form of duplexes (eg. 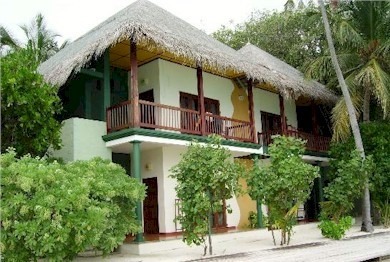 Bandos, Club Med Kani, Kandooma). 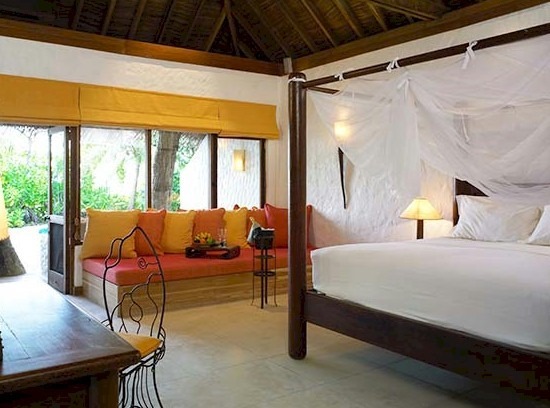 And if you really want not just a room, but a whole resort, “with a view, then the entire Club Rannalhi has an lofty vibe to the whole property. 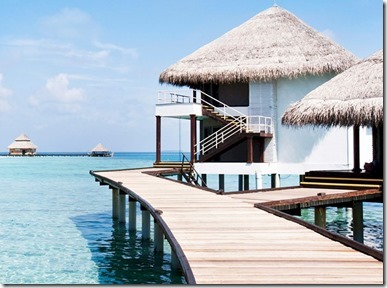 Everything two stories it seems – reception, dive centre, spa, rooms, some of the new water villas. Even the theatre has raked seating. 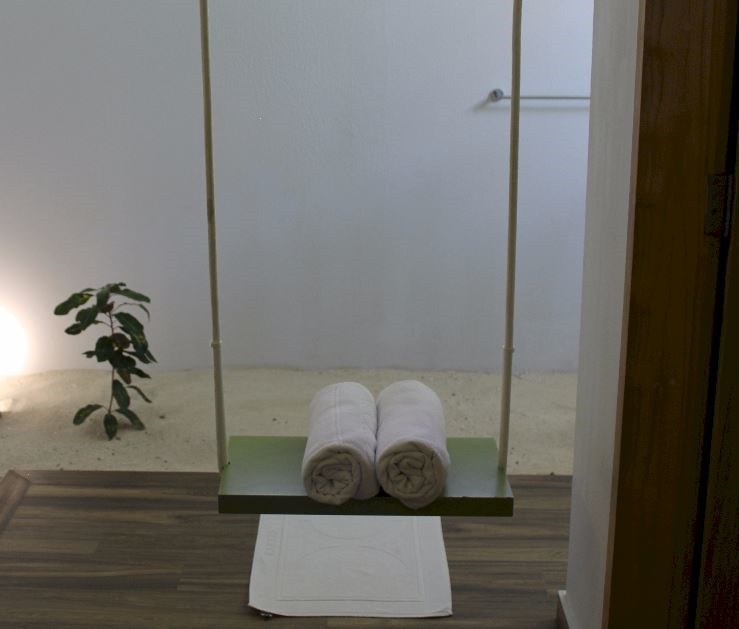 Boost your holiday at Club Rannalhi. 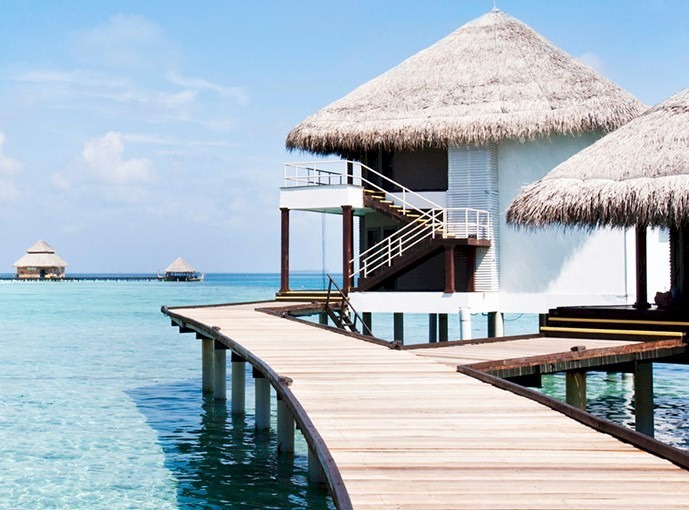 Perhaps the greatest allure of the Maldives is its intimacy with the ocean. The diminutive islands are nettled just at the water level so you are never far from it vertically or horizontally. Some of the bigger islands lose a bit of this aquatic intimacy. 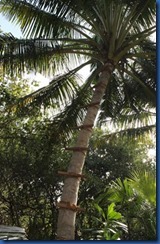 But one of the longest islands, Canareef, has as much if not more pervasive ambience of surrounding seaside. Primarily, because it is so skinny. With the shoreline only a few dozen meters away on either side of the island, the ambient noise of gentle waves permeate the air up and down the island. Seashore – One side dramatic surf, the other side mill pond calm. 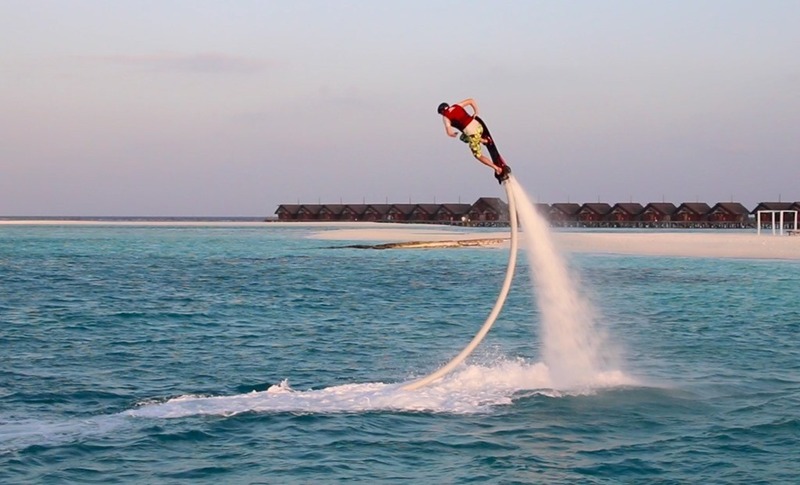 Both along the longest coastline in the Maldives resorts. Pools – Also a top of the league table number. 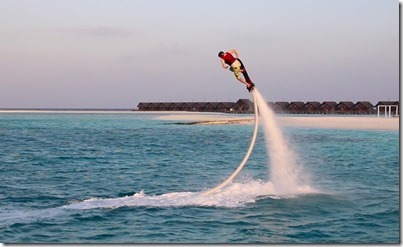 Channel – A relatively rare feature in the Maldives. Even your own Jacuzzi if you like in the Jacuzzi Villas. If water is what drew you to this destination that is 99% ocean, then Canareef tops it up just a bit further. In my top ten FAQs is ‘what best resort for singles?’ These visitors are not looking for some sort of groovy ‘hook up’ resort. Rather, they simply just don’t want to feel all self-conscious being a singleton in the land of dewy-eyed honeymooners and other romantic holidayers. More catering for this segment was listed in one of my first “Haven’t Seen Yet” pieces. This segment is significant and growing. People get married later, relationships last fewer years, and older people lose their partners through passing. 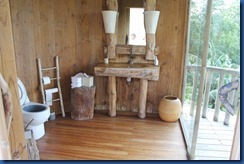 These guests just would like to (a) not be jonny-no-mates, and (b) not pay big premiums for being alone. Diversity – There is so much diversity in Kani’s clientele, no one would feel out of place. There are couples on honeymoon. There are families. There are groups of friends. There are groups of families. And yes, there are singles. 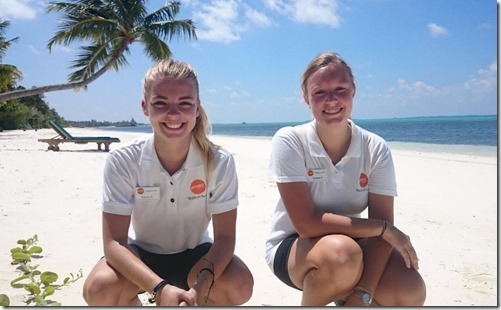 Staff – Club Med is renowned for its hyper-friendly ethos and ambience. The staff all bubble over with amiability. 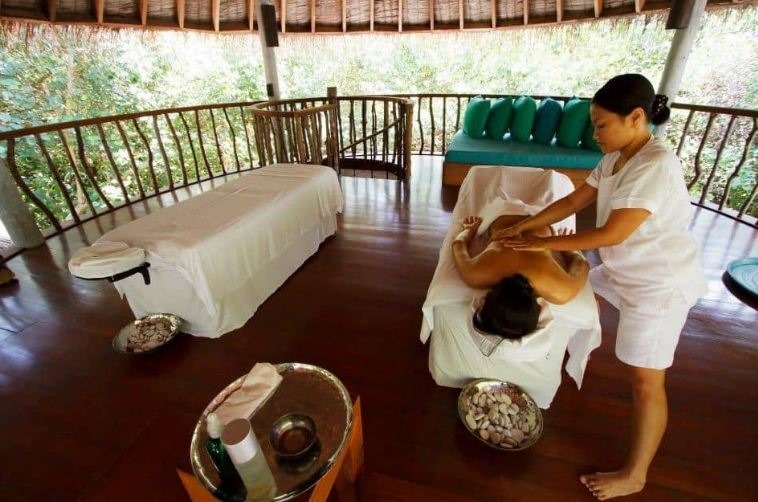 The resort has a practice where all staff eat with the guests (only if the guests would like the company of course) which of course would suit a single person superbly. And as it happens, many of the staff a single themselves. Atmosphere – The Club Med Kani atmosphere is simply very friendly, social and inclusive as I described in my Best of the Maldives post “Making Friends”. 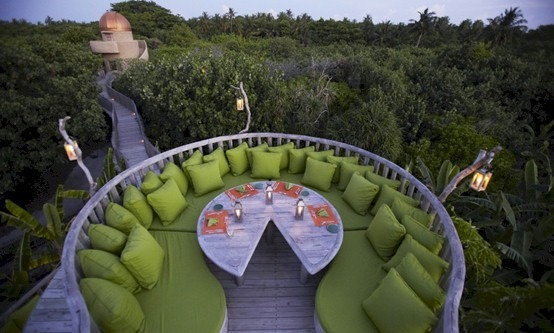 Numbers – With nearly 500 rooms, Kani is one of the biggest resorts in the Maldives. That means there are so many people that even a small percentage of any group becomes a reasonable number. 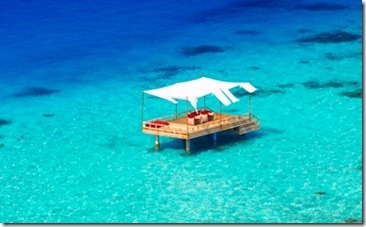 Yes, relatively few singles visit the Maldives. But at Kani you mathematically have a better chance of meeting more of them. Catering – The resort actually caters to single guests. It offers a reasonable single supplement rate on its villas. When there is enough singles in residence, it organises special activities just for them such as cocktail parties and special singles-only snorkelling outings.